Slice of Pi Quilts: It's time to Row x Row! 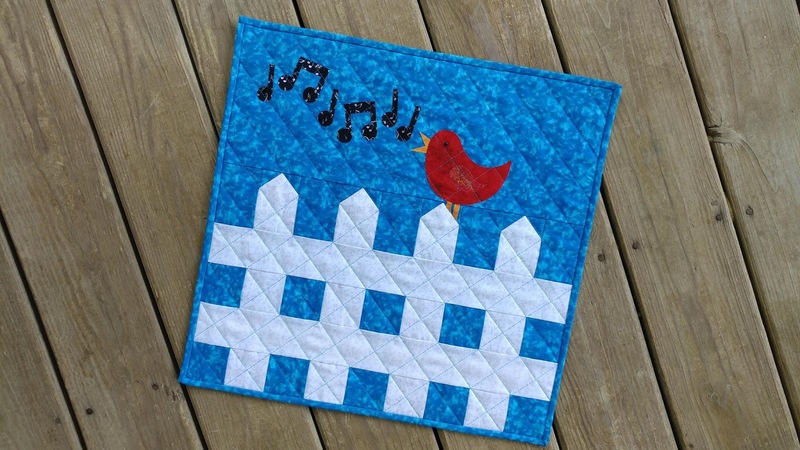 Row x Row is a quilt shop hop that happens during the summer (June 21-September 4). Each participating shop has a free pattern for a row in a quilt. 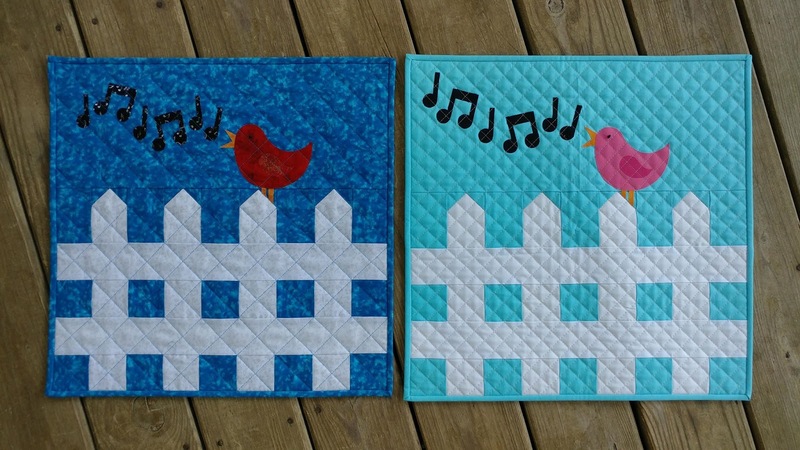 You can sew the rows together any way you like. 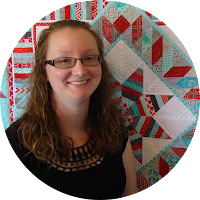 If you complete a quilt that uses eight or more rows from eight different shops, you can win fabulous prizes too! Be sure to check out the Row x Row Google map so you can plan your summer quilt shop stops! 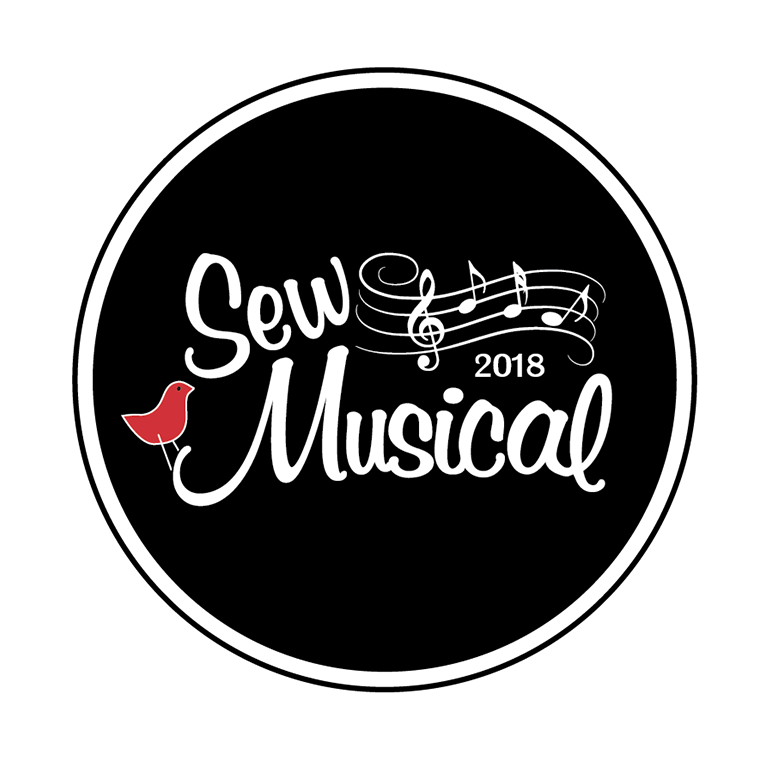 The 2018 theme is Sew Musical. 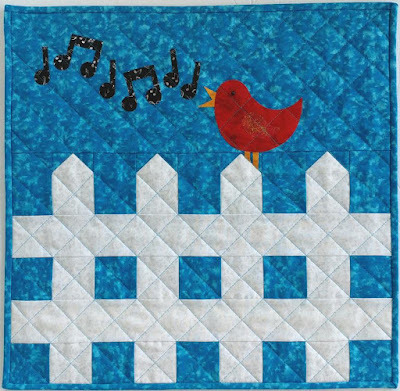 My local shop wanted a Row with a fence and bird. This year, there are four different sizes for the Rows too! 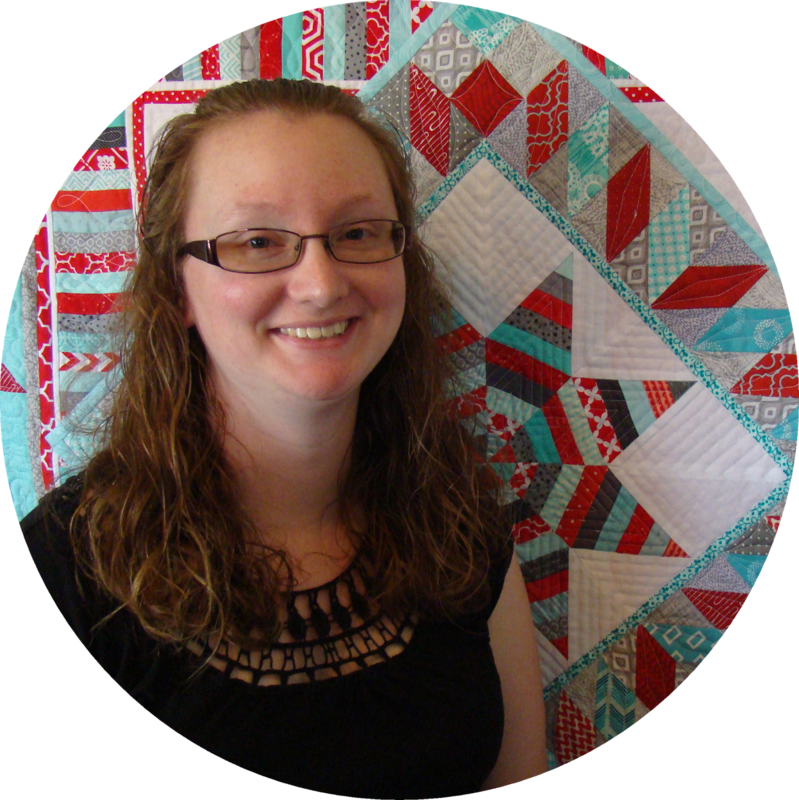 I wanted to switch it up and choose the 18"x18" size, as that's a great size for pillows and mini quilts too. Once the pattern was written, I made two samples - one with the fabrics the shop will offer as a kit with the pattern (shown below on left), and a second one using solids (you know I love solids!). 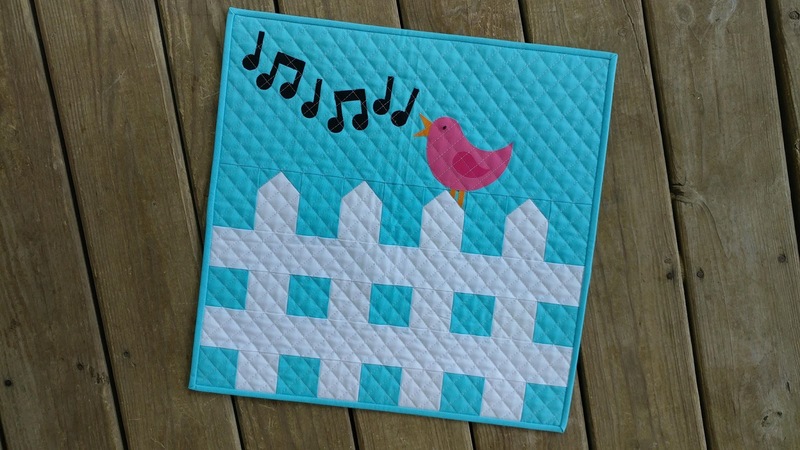 The pattern is named "Sweet Tweets" and makes an 18" finished square block. It uses traditional piecing and raw edge applique. I finished both of the samples as mini quilts, using cross-hatch quilting with my walking foot. 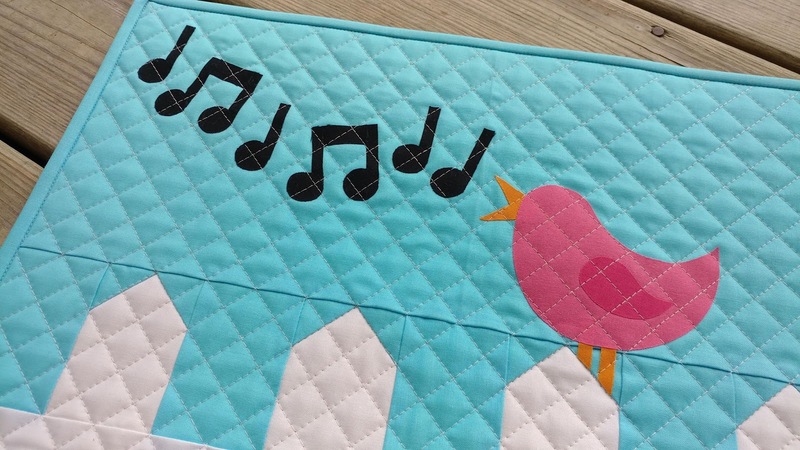 The sample using solid fabrics has a 1/2" grid, and the print fabrics sample has a 1" grid. 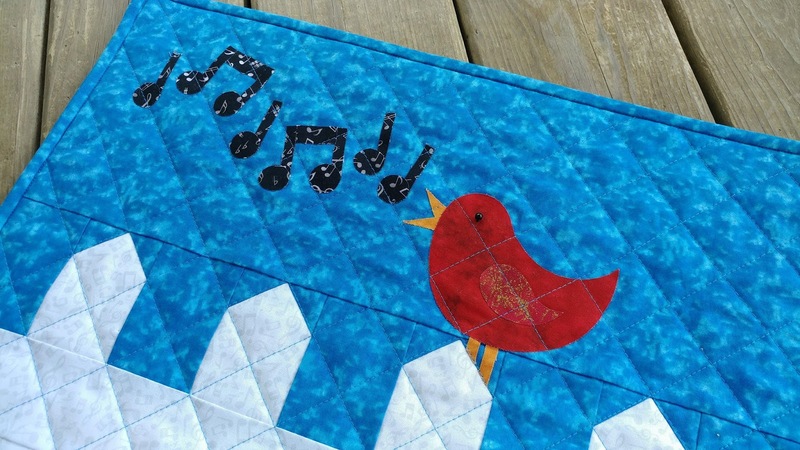 All the piecing and quilting for both mini quilts was done with Aurifil 50wt thread. I used Lite Steam-A-Seam 2 for the applique pieces. You can see last year's Row called "Chuggin' Along" here and the Row from 2016 called "Home Is Where the Heart Is" here. 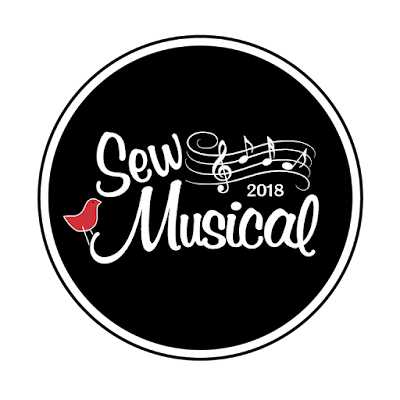 Please let me know if you are in the area and plan to pick up the Row pattern at The Stitchin' Post in Willow Springs, MO! Happy shop hopping! 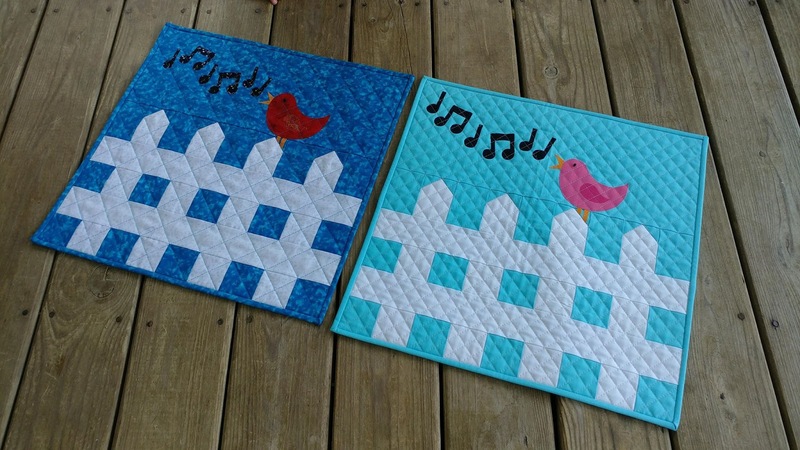 Linking up with Needle & Thread Thursday at My Quilt Infatuation, Can I Get a Whoop Whoop at Confessions of a Fabric Addict, TGIFF at ChezVies, and Friday Foto Fun at Powered by Quilting. 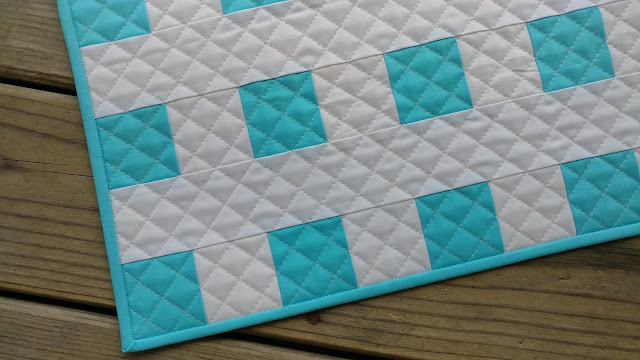 I love the new size variations; having an 18" finished block is a great option for turning into mini quilt (like yours) or pillows. Very fun design, and I can just hear the bird chirping looking at them! This is one of the best I've seen! Darling block! While I haven't made a Row by Row quilt, I appreciate the maps showing where all the quilt shops are located and refer to it anytime I'm on a road trip. I love the new sizes and your block is so cute. A little too far for me to visit from Pennsylvania but I will enjoy seeing the blocks from afar.